Below is the text of the paper where Christophorus Henricus Diedericus Buys Ballot first presented his famous law on wind and pressure in an English publication in 1863. The first appearance of this law in French was 1857. You will see that he was then Director of KNMI, which is still a world leader in meteorology research and the folks who bring us the ASCAT data. There are several new ideas in this publication. First it appears he is proposing to carefully measure the elevation of the barometer above sea level and take that into account, which he suggests is not done properly in the past. Then he compares the pressure reading with a value he computes for that elevation, which appears to be based on an average value for the date at hand. The difference between the measurement and the average value he calls the “departure.” Above average he calls Positive (equivalent to Highs) and below average he calls Negative (equivalent to Lows). This is effectively a calibrated atmospheric pressure, and as such the elevation of the instrument is crucial. He then states his famous law. Namely that wind will not be blowing from High to Low pressure, but perpendicular to the line between them. He states that if Higher pressure is north of you, label the wind East and if Low pressure is north of you, label the wind West. This is all new territory for people at the time. 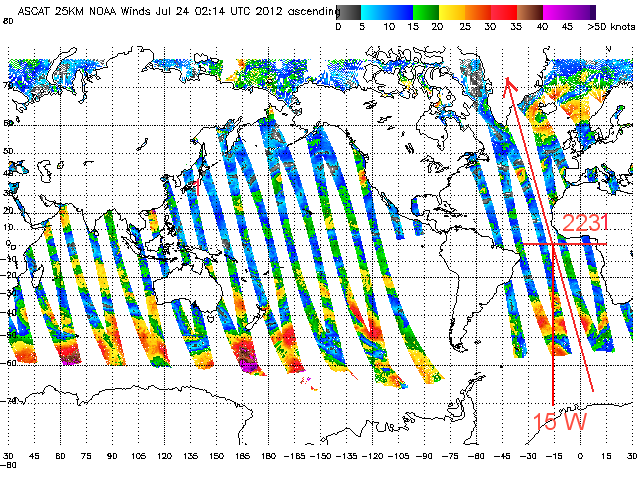 Namely, how to correlate the wind direction with the pressure observed. Note too that he is naming the direction the wind comes from. Then he tells us how to remember this: When you “place yourself in the direction of the wind” (ie wind on your back), then the direction to least pressure is on your left. He goes on to say that this is the direction of the greatest decrease in atmospheric pressure, which we often over simplify when we reword it as “pointing to the Low”. These days we see the law with wind on the face and wind on the back, but if we stick to history it is best to use the law with wind on the back. And he goes on to tell us some early estimates of geostrophic wind speed (in his own sort of way), namely if the pressure difference between his north stations (Den Held and Gronigen) and his southern stations (Vlissinger and Mastrich) is less than 4 mm of mercury (which is 5.3 mb) then the wind will be less than 30 pounds force on a square meter surface.... which are strange, mixed units to modern readers, but this is the way they described wind speed in those days. Note too they were all using mercury barometers in those days, which is only right as the then new (and very popular) aneroids were not nearly so accurate nor dependable. 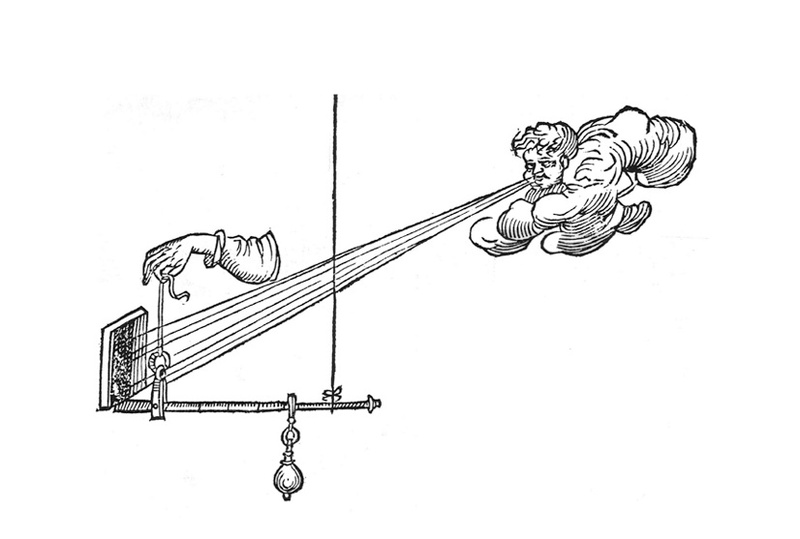 We have not used these units in our weather course or in Modern Marine Weather (but we do include a frontispiece illustration of the idea in the book, shown above), so this will take some conversion. You can use the units converter from our Weather Trainer Live for the details. Use one of the online glossaries to look up “wind pressure” to find that the force of the wind per unit area is given by Wp = ρ*V*V/2, or one half the air density times the wind speed squared. Wp is in units of Pascals, which are Newtons per meter squared, and V is in meter/sec. Thus you end up with Wp = 0.6 V*V, since density of air ρ is 1.25 Kg/meter cubed. If we look at a map of Holland below, we find that the average distance N-S between Den Held and Gronigen to the north and Vlissinger (Flushing) and Mastrich to the south is about 113 nmi, thus he refers to a gradient of 113 nmi per 5.3 mb = (x 4/5.3) = 85.3 nmi (1.4° Lat) per 4 mb at latitude 52N. From Table 2.4-1 in Modern Marine Weather we would expect a wind of 0.8 x 40 /(1.4 x sin 52), which equals—quite remarkably—29 kts! with a graphic we added to clarify the text. Director of the Royal Netherlands Meteorological Institute. 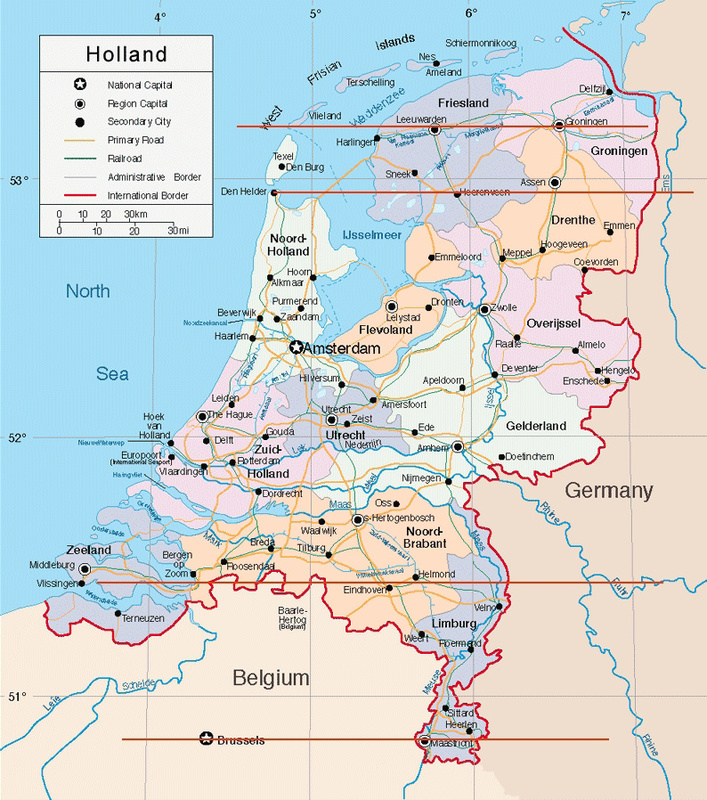 In the plan pursued in Holland, observations are taken at four principal places: Helder, Groningen, Flushing, and Maestricht. On the indications afforded at these places the forecasts are based. For every day of the year, and for every hour of the day, I have very carefully determined the height of the barometer in the place of observation at that height above the sea where it is suspended. This is a cardinal point not sufficiently observed in England, and not at all in France. The difference of an observed pressure from that calculated on, I call the departure of the pressure—positive when the pressure is greater, negative when it is less. Those departures, besides the observations of the other instruments, are communicated from post to post. The rule is now very simple. If the departures are greater (more positive) in the southern places than in the northern, greater at Maestricht or Flushing than at Groningen or Helder, the wind will have a W. in its name ; when the departures are greater in the northern places, the wind will have an E. in its name. More accurately, you may say, the wind will be nearly at right angles with the direction of the greatest difference of pressures. When you place yourself in the direction of the wind (or in the direction of the electric current), you will have at your left the least atmospheric pressure (or the north pole of the magnet). When the difference of pressure of the southern places above the northern is not above four millimeters, there will be no wind of a force above 30 1bs. on the square meter. Moreover, the greatest amount of rain will fall when the departures are negative; and, at the places where the departures are most negative, there also the force of the wind will be generally stronger. Moreover, there will be no thunder if the barometric pressure is not less than two millimeters above the average height, and when at the same time the difference of the departures of temperature is considerable. These rules, and especially the first two, were laid down by me in 1857, in the Comptes Rendus; and on the 1st of June, 1860 the first telegraphic warning by order of the Department of the Interior was given in Holland. It was unfortunate that those telegraphic warnings were not introduced four days sooner, for in that case the first communication would have been a first warning against the fearful storm of May 28, 1860, called the Finster-storm. All of you know how amply Admiral FitzRoy has arranged the telegraphic warnings all over England. The rules used in Holland have answered well, as is shown in the translation of a paper by Mr. Klein, captain of a merchant-ship, whereto I have added my observations and signals compared with the signals of Admiral FitzRoy. My own paper dates from June 1, 1860, and is extracted by Mr. Klein; but I preferred that the less complete and precise paper of a practical man should be translated, because I thought that the seamen would put more reliance on it. From the tables added to that translation, it appears that I have warned from my four stations just as Admiral FitzRoy has done from his twenty. It must, however, be recorded that, besides those four stations, there are also some stations—Paris, Havre, Brest, in France, and Hartlepool, Yarmouth, Portsmouth, Plymouth, in England—that send me their observations. Generally they arrive too late; and therefore they throw very little light on the forecasting. Note we found the distance by taking difference between most north and most south city = 160 mi and then the two closest were 100 mi apart, then averaged to get 130 mi, and then converted to nautical miles. Since Buys Ballot was so careful to stake out his publication dates, the only thing we add to these notes on this milestone paper in meteorology, is that the American mathematician William Ferrel actually published the prediction and theory of this effect a year earlier (1856), but this was not known to Buys Ballot. Ferrel proposed this law in the same paper where he was the first to ever apply the concept of the Coriolis effect to wind flow, which is fundamental not only to this law but to all of basic meteorology. He went on to many other remarkable achievements in meteorology and astrophysics. But if you did not read the Appendices to the Annual Reports of the US Signal Corps or an obscure medical journal in Tennessee, you would never know it. Ferrel was, for example, the first to propose the method, essentially still used today, for reducing elevated atmospheric pressures to their equivalent sea-level values, which Buys Ballot also saw the importance of in this paper. You will find this little known gem in the same Signal Corps Report that tries to explain the Apache chief Geronimo's use of smoke signals! We have elsewhere another illustration of the Buys Ballot principle intended to make it easier to remember. ASCAT is the name of the scatterometer that provides true wind speed and direction on the ocean surface about once a day in most places. The scatterometer is on board the EUMETSAT (www.eumetsat.int) satellite Metop-A, so it is helpful for us to know when the satellite will pass by to give us this valuable data. And I should say up front, there are other ways to figure this but for now we start with the most basic of predicting this pass time from the satellite characteristics and available satellite prediction apps. It will take some time to get the actual data after it goes by, but the valid time is when it actually went by...and you may want to know this ahead of time so you can prepare to make some weather map comparisons with the actual winds you can learn from the satellites. but for now we are discussing the time predictions, not the data. We know roughly when the satellite will pass by us because it is in a sun synchronous orbit, meaning it crosses the equator every day headed north (ascending node) at the same time relative to the sun. 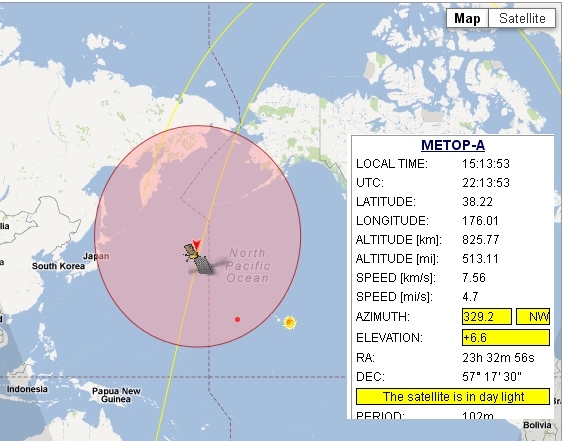 For Metop-A this is 2131 local mean time (LMT). This is not zone time or standard time or even GMT. It is a special time concept, which is best interpreted as the GMT of the event observed from the Greenwich meridian. To figure the crossing time at other longitudes, we have to account for the westward motion of the sun at 15º of Lon per hour. Thus on a Lon near Hawaii of exactly 150º W, the ascending node would take place 10h later at 3131 = 0731 the next day. The satellite circles the earth once every 102 minutes (1h 42m), so the date is not important here; we just want to illustrate the LMT concept. But this is not very specific prediction information for an arbitrary point on earth for several reasons. First, the earth is rotating beneath the orbit of the satellite, so the satellite path across the earth tracks to the west as it proceeds north as the earth rotates toward the east. So we don't immediately know what its longitude was when it crossed the equator to reach us at our more westerly longitude. Second, though it does move north very fast (360 x 60 nmi in 102 m) it still takes some 13 min or so to get from the equator up to say 45 N, so pinpointing the time it will pass is more involved. To make things worse, knowing when it crosses the equator every 102m does not tell us if it will indeed cross at a place that will give us data. In other words, if i am going to get data near HI, it will be in the early morning around 0730 plus some, but i do not know if i will get it today or not till tomorrow. We also have the descending swath headed south that might hit us as well. Here we see an ascending pass crossing the equator at 2231 at 15 W (an hour after 2131). The ASCAT data are the two swaths on either side of this track. This picture shows a total of about 14 ascending passes. The swaths are the same width on the earth at all latitudes (500 km) but get wider with Lat due to the map projection, which is similar to a mercator. These pics are from the manati link above. Similar indexes to the data are found at the knmi site. Here we see the satellite coming back down on the other side of the earth 51m later. Note that it does not cross at 15W + 180 = 165E, but farther E by (51/60)x15, at about 153E, because the earth rotated to the east by that amount during the 51m travel over the top. Again the data we are after are the two swaths on either side of this track. With these complexities, we are generally happy to have some computerized aid to predict the satellite passage times. There are several options to choose from online, as well as computer and smart phone apps. (1) The Data Center at the University of Wisconsin-Madison Space Science and Engineering Center (www.ssec.wisc.edu/datacenter/METOP-A) has plots online of the Metop-A positions such as shown below. You can select up to 5 days in advance to get plots like this. There is no satellite info for various locations, just the times and the paths as shown here. (2) NOAA recommends an online prediction site at http://www.n2yo.com/satellite/?s=29499, where the last digits are the NORAD ID for Metop-A. This site projects the path onto Google Earth, and also shows observational information, but to enter a unique lat and lon for observation you have to register on the site. This is non invasive, with no personal info required. A sample output is shown below. The red dot is a vessel position that I entered as 20N, 170W. The interface is a bit clunky, as are the ads, but all the data are there. We compare this to the Orbitron display below. (3) A very neat free PC app called Orbitron not only has a versatile predictor, but you can also use it as a screen saver so Metop-A and OceanSat2 (the OSCAT satellite from India) are always on your mind! Get it at www.stoff.pl. It is postcard software. The author just asks that you send him a post card if you like it. We have sent ours. The ring around the satellite is its visible horizon, so we see that the satellite is over the horizon from our position, about 7º high in the sky, bearing 328. Same vessel position. Note that Orbitron uses your computer time, so having another free app like NIST32.exe to keep your computer locked into UTC is valuable (www.nist.gov/pml/div688/grp40/its.cfm). These are both PC apps; i do not know of Mac equivalents. Also, Orbitron calls Metop-A by the name SARSAT 11, which means the author attributes more importance to its search and rescue pay loads than the meteorology instruments. As mariners, we have to be grateful for both.... but you must know this to find it in Orbitron! Note added June 4, 2017. This app no longer works. It was replaced with a pay version $3 only, but no reviewer says it works either! so we have to look for another app. There are others to test... and they will offer about the same functionality as described here, so i leave the basic idea of its use. (4) Another, maybe most convenient of all, option is the iPhone app called Satellite Tracker by Susan Mackay. She is in Australia, I believe. 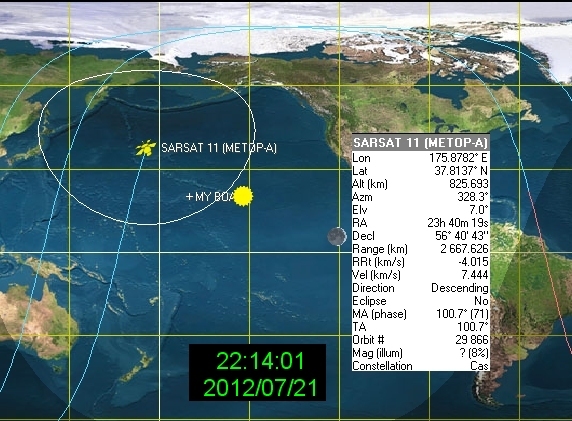 http://itunes.apple.com/us/app/satellite-tracker/id306260378?mt=8 Output is shown below so you can compare all of these methods for the same day of July 21 about 2200z. It will do both Metop-A and OceanSat2. In this radar type view, the local position (20N, 170W) is in the center. Each ring is 30º of altitude. The sun is high and to the East. The moon is at about 095 at about 40º high. If you watch this app live, you see the satellite moving along the track. This example is in a descending mode, headed south but still bending to the west. This display shows the next several passes, ascending and descending. Click any one of these in the app to get the picture above it. In the above examples, i put the boat position at 20 N, 170 W so we could compare them. Each of these apps let you watch the satellite come cover the horizon, peak out, and then set. For the best satellite predictions, your stand alone options (Orbitron and Satellite Tracker) require you to update the latest satellite parameters every few days, called TLE (two line element) files. They are provided by NORAD. The programs do this automatically. It takes just seconds. These apps show all the passes, not just the ones that till yield data. If the satellite passes too low in the sky, its scatterometer can not reach out to where you are, so no data. And with ASCAT, if it passes right over head there is also no data since it has a nadir gap of no data right below it. Its data starts some 360km either side of the track below it and then they extend out 500km from there. OSCAT does not have a nadir gap. It is my feeling that if we are to incorporate this valuable data into our navigation and weather routing, it pays to understand the basics of what is involved. In other words, so you could answer the question, why don't we have data all the time, whenever we want it? Once a satellite goes by on a favorable pass, we generally get actual ocean wind speeds and directions along those two swaths in about 3 hours. This may seen a long delay, but recall we do not get the surface analysis maps for about this same delay past the synoptic times. So in that sense, this is as fresh as it comes in the middle of the ocean. There is another satellite (from India) sharing data with us now called OceanSat 2 (OSCAT), and hopefully more on the horizon. So this important area of meteorology is getting better all the time. These satellites are timed to give optimum coverage, not just redundancy. Two more updates: OSCAT failed permanently in 2014—maybe there will be an OSCAT2, using a new satellite OceanSat 3. Now we have RapidSCAT, which has good data but it is on the International Space Station (ISS), and because of that it cannot run continuously when it conflicts with other ISS projects. Also, ISS is not in a sun-synchronous orbit, so we cannot predict its location as easily, but there are numerous apps that predict it because it is visible to the naked eye—we just have to ask for "all passes," not just visible ones. 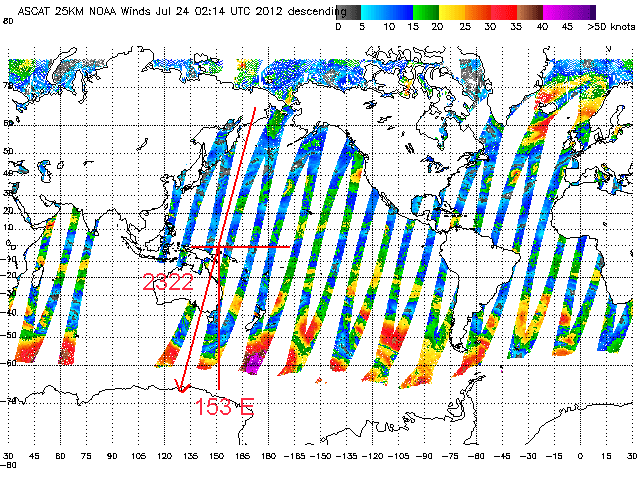 The other update is we can now get the ASCAT wind data in GRIB format from LuckGrib (mac only) or from Ocens (PC only). If you want to know when the latest ascending and descending passes were nearest a specific Lat-Lon, see the notes in www.starpath.com/ascat. We will try to keep that up to date. There are a dozen or so timekeeping systems used in navigation and weather, and we cannot avoid using several of them from the nav station. In the end, the main time we care about is GMT, more properly called UTC, Universal Coordinated Time. All weather data is coordinated and reported according to UTC. In principle we should all be calling this UTC, not GMT, but GMT is still common. It is rather like the fact that we should all be using the metric system for these two subjects—it is in fact US law that we should—but no one does, and no one complains. The BBC still uses GMT. UTC is the world standard time system used by all nations to coordinate weather and navigation information. It corresponds to the time used in Greenwich England for half of the year, formerly called Greenwich Mean Time. The town of Greenwich actually switches to daylight saving time in the summer, but all scientists and navigators continue with UTC. The official UTC system (like GMT) does not employ any form of daylight saving time. Since all weather maps and GPS information uses UTC it would seem we would want to keep our watches and ship's clocks on UTC for convenience. It turns out this is not very convenient in practice. For daily activity—at home or underway—it is much better to have our clocks reading close to what we are used to, which is often referred to as local time. Local time, however, is a nebulous term, which when used should always be followed up with the definition of what we mean. There are two basic times it could mean. Local time could be the local standard time (that is well-defined) or it could be the local zone time (also well-defined). To confuse matters a bit, local time is also sometimes used in phrases such as Pacific Time, which is intended to be Pacific Standard Time in the winter and Pacific Daylight Time in the summer—the one phrase covering both, depending on the season. Zone time is by far the more precise of the several local times. It is the one that commercial ships and navies use when crossing an ocean—or we all use when sitting at the USCG office taking a license exam! Zone time is determined entirely by the longitude of your vessel at the time you record it. It will differ from UTC by a whole number of hours called the zone description (ZD). In this time system, the world is divided into 24 time zones , each 15º wide, centered at the standard meridians, which are the longitudes that are multiples of 15, ie 0, 15, 30, 45....165, 180. The borders between time zones thus take place at 7º 30' either side of the standard meridians. 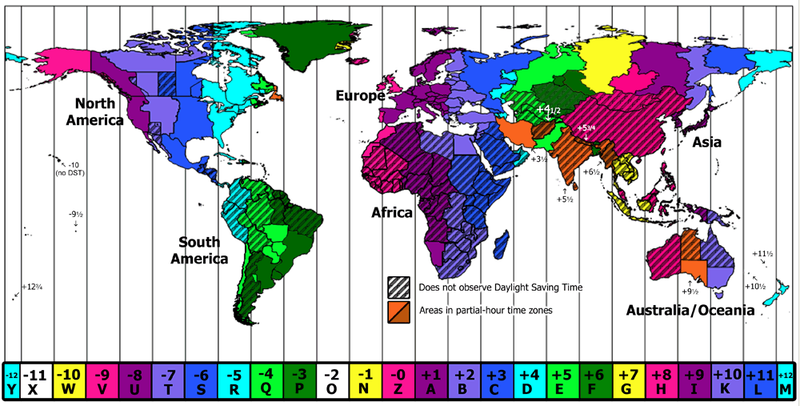 The only exceptions are the two zones (ZD = ±12) on either side of the International Date Line, which are only 30 minutes wide (7º 30' of longitude). where, again, the ZD is determined by your longitude. This formula is the one that determines (or helps you remember) the sign (±) of the ZD. If your location is slow on UTC, ie any west longitude, then the ZD of that location is +. Eastern longitudes have negative ZDs. To find the zone description of any particular longitude, round the longitude off to the nearest whole degree, divide by 15, and then round the result off to the nearest whole hour. Zone time never uses daylight saving time. It is used worldwide. Zone time is never used in civilian matters; it is only for ocean navigation. One could argue that official NOAA Tide and Current Tables are given in what is essentially ZT, but we are more likely to use a reproduction of these, which converts the times to standard times. 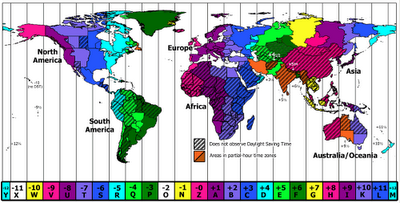 Gray lines and bottom labels define zone time zones; boundaries shown on map defines standard time zones. Unfortunately, this nice graphic from nist.gov has the time zones labeled in the landsman's convention. The navigator's ZD of the US West Coast is +8, not -8. Since Zone 0 (UTC) is labeled Z, UTC is often called zulu time, and noted ie 1200z. We leave it to those interested in history to discover why there is no J zone. There was a reason. And if you want to ask trick questions on your navigation tests, note that ZD +12 and ZD -12 are just 30m wide, not the normal 1h. Standard time is the time system used for civilian matters and for near coastal and inland navigation. Some coastal weather forecasts specify the local standard time in addition to the UTC of the report. Standard time is essentially the local zone time modified by politics and geography, and then susceptible to changes for daylight saving time. Standard time zones do not follow longitude lines rigorously as do the zone-time zones, but they will often be approximately along those lines, diverting to follow state and country boundaries, or maybe a river flow. We still speak of the zone descriptions of standard zones in the same way as zone times, namely Eastern Standard Time (EST) has ZD = +5. Eastern Daylight Time would be ZD = +4, and so on. In other words, we would have UTC = EDT + 4h. A complexity arises because standard times are often described outside of marine navigation circles as, for example, EDT being 4h behind UTC or slow on UTC. This leads to writing EDT = UTC – 4h. This is the same equation (with sides swapped), but in this line of thinking the time zone is described or labeled as -4h. Thus we often see computer and smart phone apps using reversed signs for the time zones, so we have to keep an eye out on this detail. 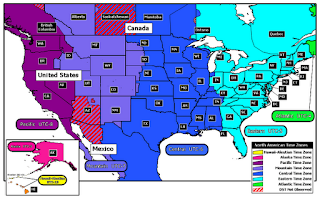 North American time zones. From nist.gov. That site along with time.gov are good sources for various aspects and history of timekeeping. Watch time is the practical solution to time keeping in navigation and weather. It is simply the time on your watch. Thus to navigate by WT, I just need to know the zone description of my watch. If I happen to have my watch set on Pacific Daylight Time, that would correspond to ZD = +7. Thus the ZD of my watch is +7 and that is all I need to know, no matter what longitude I am at as I cross the Pacific. UTC = WT + ZD. This is by far the best way to navigate, and we should always do so unless we are compelled to use ZT by labor laws or unions or some government regulation. It is easy to see that if you work day and night on ocean crossing vessels, you would want some semblance of order to your daylight and meal times, which would justify changing the ship's clocks each time you cross a time zone. On a private vessel, however, this time changing just adds tremendous confusion to your weather and navigation. It is much better to just live with the fact that mid day might be 2 pm on your watch by the time you arrive.... or set it ahead before you leave. In other words, you go an hour or two off local time as you proceed, but that is not distracting. To minimize timekeeping errors do not change your watch time when underway. Wait till you arrive. You are free to set the ZD of your watch that works best for you. For completeness, we include here also the very worst type of timekeeping, the one called Chronometer Time. It is UTC kept on a 12-hour watch face, without specifying AM or PM! Absolutely no one in the world would consider using such a time system—that is, almost no one. This is the time system used on USCG celestial navigation exams. It is the way they help support navigation schools, and we are grateful to them. I should add that there are several forms of Universal Time and the conventions on terminology and abbreviations have not settled in yet, which is why so many folks hang on to GMT. The time that is equivalent to GMT is officially called Coordinated Universal Time, Type 1, and abbreviated UTC1, though this formal terminology is not often seen in navigation or weather resources. This is usually abbreviated as UT (Nautical Almanac) and UTC (NOAA weather maps). Some weather maps and forecasts also use the abbreviation Z (zulu) to mark a UTC, as we used to do for GMT. Thus when we see a map valid at 1200Z it means 1200 UTC. There are other time systems that have implications to navigation and weather, but only indirectly. These include the Julian Time system used by astronomers to keep track of an absolute time stamp for events in the past and future and the Solar Time system used to keep track of time relative to the time the sun crosses your meridian. The latter was used commonly in the old days of navigation, but no longer, though it still comes to play when predicting the passage times of weather satellites in sun-synchronous orbits.